A party game that actually works and it's name isn't Mario? Get outta here! 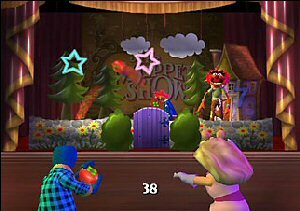 This take on the party genre, whilst not up to the standard of Mario Party, is the best that you will see on a console other than a GameCube. 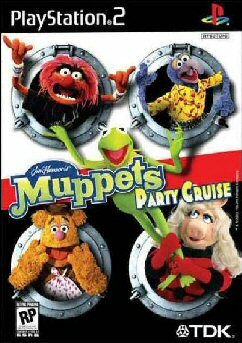 Take a popular franchise such as the Muppets, throw them on a cruise ship and then lightly sprinkle with a mix of fun little games and you have a recipe for hours of fun. The design of the game is an odd one where you play your games on a cruise ship, however unlike Mario Party, the boards that you move along on are actually decks of the cruise ship. It's a neat way to present the title although at the same time in an odd way it does make the game take a little longer to figure out how to play the title properly. There are 30 great little games in this one, although 15 of them only are unlocked at this stage. The characters are very well modelled and anyone who has been a fan of either the original series will be very pleased in the way that our favourite Muppets are presented on the small screen. Around each deck are a number of obstacles and benefits to the player, making it a game in itself just moving around the ship's deck. There are so many great little games to play in this game that there really should be no one who is disappointed when having a game, except for in single player mode where the AI will either whip you or you will totally dominate it. There doesn't seem to be much of a middle ground as far as the AI is concerned during a game. And, for the most part, they will do really well. I'd recommend playing this game with your multitap and 3 other games. Yes you heard me right, this baby supports 4 players and this is something that's been long overdue in a PS2 title. You and your friends will have a ball playing this game over a bowl of chips and some refreshments and the sheer ridiculous nature of some tasks will have you in stitches even as you grapple with some of the tasks. purchase with this item even if you are not sure that you'll have four people to play as the game is so much fun that it makes for an easy entertainer for all ages all day. What may throw some gamers is the fact that you don't have to move around the board the same as other games in a particular direction. In this one, you can go wherever you like. 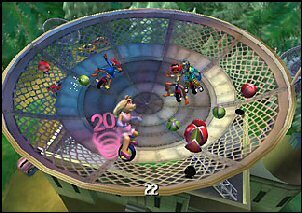 Moves on the board are allocated to a number of spaces that is dictated by a pinball like device that drops a ball in to a numbered slot. Rather than feeling helpless about this, you can 'tilt' the machine to try and alter the outcome of the ball drop. It's a nice touch. You get to control one of six of the Muppets, being: Kermit, Miss Piggy, Animal, Gonzo, Fozzie, and Pepe. They all look great and have been included with their signature comments, which by the way do get a tad repetitive over the long run and also little moves that fans of the show will recognise as being faithful to the series, though for the most part they do move in a manner very similar to each other. There are many others shown during the game, however it's this core group that you will start with. My two favourites were Fozzie and Gonzo, I always liked the frog but he was too straight laced for me. In summary, I have no problem recommending this game to anyone for a bit of idle fun. The mini games are more fun than the general moving about on the ship deck and it's best to get these underway as much as you can. It's not going to rewrite the books on how a game should be and it certainly wouldn't be worth the one hundred clams that a new game often does. If Take2 put this baby out as a budget game like they did in the USA then it should do quite well as a fun little game. A good effort put in here and I'd be interested to see the next installment should they choose to do one.